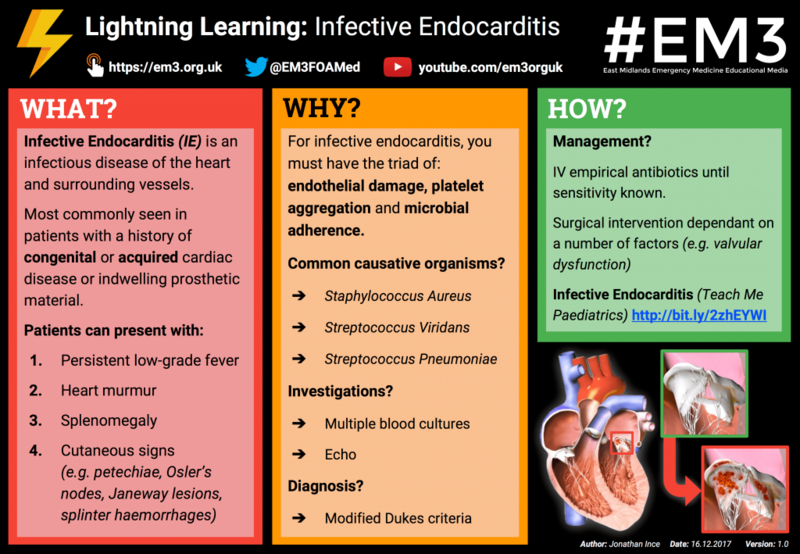 Infective Endocarditis (IE) is an infectious disease of the heart and surrounding vessels. It is most commonly seen in patients with a history of congenital or acquired cardiac disease, however an increasing number of cases are due to invasive instrumentation procedures and indwelling prosthetic material (1). IV drug users have an increased incidence of IE however fortunately this is still rare in the paediatric population. The most common underlying congenital heart disease conditions in which IE occurs are; ventricular septal defects, patent ductus arteriosus, aortic valve abnormalities including bicuspid aortic valve and tetralogy of fallot (1). This can be pre- or post-repair but if post-repair, the presence of a residual defect increases the risk of IE (1). In order for IE to occur you must have the triad of endothelial damage, platelet adhesion and microbial adherence (1). In the case of structural abnormalities of the heart or great vessels, there is a significant pressure gradient with or without turbulent flow leading to the endothelial damage through sheer stress forces (1-2). As for prosthetic material, they can also cause endothelial damage and promote a sterile platelet-fibrin deposition on this endothelium (1-2). Once this has occurred, there needs to be a bacteraemia which can then adhere to this lesion and go on to invade underlying tissue. Once established and attached to the lesion, the bacteria are protected within the vegetation from phagocytic cells and host defense mechanisms and so can proliferate easily (1). Organisms that cause IE have been seen to have specific surface receptors to fibronectin that allow the microbe to adhere to the thrombus at the outset (1). Such organisms include Staphylococcus Aureus, Streptococcus Viridans, Streptococcus Pneumoniae, HACEK organisms (Haemophillus, Actinobacillus, Cardiobacterium, Eikenella and Kingella), Group A, C and G Streptococci and Candida albicans (1-2). Certain organisms have been found to be associated after certain procedures. For example Alpha-haemolytic Streptococci (S. viridans) are most commonly found after dental procedures and Enterococci are commonly found after genitourinary or gastrointestinal surgery (2). Persistent low-grade fever, especially without another clear focus, is a concerning feature and should promote IE as a consideration. This is especially if there is a history of congenital heart disease, previous cardiac surgery or indwelling prosthetic material. A heart murmur is almost always present formed either by turbulent flow around the vegetation or due to underlying heart disease. However, a change in the murmur is a concerning feature. Splinter haemorrhages are one example of embolic phenomena that are seen in IE. Others include pulmonary emboli, haematuria due to glomerular nephritis, cerebral emboli causing seizures or hemiparesis, or roth spots which are retinal haemorrhages with pale centre often seen near optic disc (2). However, it is important to remember that IE can present in a non-acute or sub-acute form. In these cases the clinical presentation can be subtle with non-specific symptoms including fatigue, malaise, weight loss, myalgia or possibly asymptomatic. Furthermore, they could present after a longer period of time with cardiac failure due to valvular destruction. The main investigations of choice for IE are blood cultures and Echocardiography (ECHO). Positive blood cultures are present in 90% of IE cases (2). Multiple samples taken over the course of 48-72 hours from multiple sites are best in order to get a positive yield. It is also essential that an adequate volume of each sample is acquired to increase positive results. Other blood results that suggest a diagnosis include anaemia, leukocytosis and raised ESR. Microscopic haematuria is also found in nearly a third of patients (2). As for ECHO, the aims of examination include identifying vegetations and assessing the intracardiac damage done by these vegetations. It is however important to remember that both the absence of vegetations does not in itself rule out IE and conversely the presence of vegetations does not confirm it. This is due to the possibility of small vegetations already having embolised causing a false negative result or normal anatomical variants, sterile thrombus or old treated thrombi leading to a false positive (2). Microorganisms consistent with IE from persistent positive blood cultures – 2 positive cultures taken >12 hours apart OR all of 3 or a majority of 4 separate cultures of blood (with first and last drawn >1hr apart). In order to confirm the diagnosis there should be two major criteria, one major and three minor criteria or five minor criteria (3). The diagnosis is suspected if 1 major and 1 minor criteria or 3 minor criteria present (4). Finally the diagnosis can be rejected if there is firm alternative explanation explaining evidence of IE, there is resolution of IE syndrome with antibiotic therapy of <4 days course, there is no pathological evidence of IE at surgery or autopsy with antibiotics therapy of <4 days or does not meet other criteria (4). Once the diagnosis has been confirmed then the decision regarding management is either medical or surgical. Whichever management option is chosen, the goal is to minimize complications such as systemic embolization, abscess formation, pseudoaneurysms, valvular perforation or heart failure (1). The eventual decision of this will be made following discussion in a multi-disciplinary setting however table 2 suggests some factors that might increase the possible need for surgical intervention. Even if surgical intervention is required, the patient will empirically started on IV antibiotics. The choice of antibiotics will eventually be determined by the sensitivities for the culture results, however consultation from the local Microbiology and Infectious Disease teams should be sought. For highly sensitive streptococci, IV penicillin or IV ceftriaxone for 4 weeks should be sufficient. Alternatively a 2 week course of the above in combination with IV gentamicin may in some instances be sufficient. Previously it has been standard practice for healthcare professionals to give patients with congenital and acquired heart disease antibiotic prophylaxis for invasive procedures such as dental procedures or for some respiratory, gastrointestinal surgeries or cutaneous biopsies. However, this policy has now changed with the most recent NICE guidance (5). It still agrees that patients who have acquired valve disease, previous IE, hypertrophic cardiomyopathy, valve replacement or structural congenital heart disease including surgically corrected conditions (excluding isolated ASDs, fully repaired VSDs, fully repaired PDAs and closure devices that are deemed to be endothelialised) are all at higher risk of developing IE. However the advice is that it is not routinely recommended for antibiotic prophylaxis for those interventions previously covered including; dental procedures, upper and lower GI surgery, GU surgery, child birth and respiratory tract surgery (5). Thanks to the team at www.em3.org.uk we now have a ‘Lightning Learning’ resource for you to take away. (1) Lai W, Mertens L, Cohen M et al. Echocardiography in Pediatric and Congenital Heart Disease. Wiley Blackwell 2012. (4) Baddour LM, Wilson WR, Bayer AS et al. Infective endocarditis: diagnosis, antimicrobial therapy, and management of complications: a statement for healthcare professionals from the Committee on Rheumatic Fever, Endocarditis, and Kawasaki Disease, Council on Cardiovascular Disease in the Young, and the Councils on Clinical Cardiology, Stroke, and Cardiovascular Surgery and Anesthesia, American Heart Association: endorsed by the Infectious Diseases Society of America. Circulation. 2005 Jun 14;111(23):e394-434. Which is NOT part of the triad required for infective endocarditis? What do organisms causing infective endocarditis have specific surface receptors for? Which is a cutaneous presentation of IE which may be present in the paediatric population? Which is NOT a cause for increased risk of IE? Which of the following is a major criteria in the Modified Duke's criteria? Which of the following is not a common causative organism?